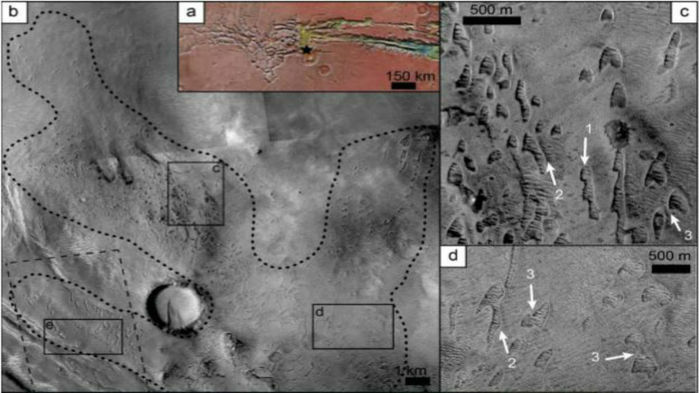 Newly spotted croissant-shape impressions (denoted with arrows, above) on Mars are giving scientists clues to the history of the Red Planet. The shapes, known as “ghost dunes,” are the hardened casts of ancient sand dunes, created when lava or sediments seeped and solidified around the lower contours of the dunes. As winds eventually dispersed the sand on top, the negative space where the dune once stood was preserved as a pit on the martian surface. While giant sand dunes have been documented in many images of the Red Planet, these new geologic features were first discovered on Earth in 2016 and only observed on Mars earlier this year. Using satellite images, researchers spotted fields of ghost dunes pitting the surface of two different regions on Mars: 480 potential dune molds at Noctis Labyrinthus, a maze-like region of plateaus and canyons, and 300 in the Hellas Planitia, a smooth 4-billion-year-old crater. Analyzing the size, shape, and age of the ghost dunes could shed some light on Mars’ climate throughout history, the team reports in the Journal of Geophysical Research: Planets. The team also says that pockets at the pits’ edges might still contain sand that has been sheltered from the elements for millions of years. According to the researchers, this ancient sand would be an excellent place to search for the molecular evidence of life on Mars, as sand dunes on Earth have been shown to support microbial life.